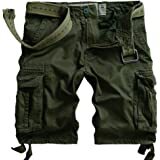 Excellent shorts - fit perfectly and are very sturdy. The look just like the picture and fit true to size. It should be apparent from the sizing 'adjustment' that you have to make that these are shorts which are manufactured and marketed for a foreign country. The shorts I purchased had tags on them written in Chinese. That being said, the shorts were heavier and more substantial than I was expecting. I will have to wait and see how they hold up, as other reviews have complained about durability. My review is to caution you that you should be particularly aware of the sizing. I typically wear size 33 or 34, but for shorts, I like to wear 34 a lot as it gives me a little more comfort when I'm lounging around the house. So for these shorts I ordered the XXL 36, which are sized as a US 34. But these are bigger than any other 34's I own. As an example, I can have them on buttoned and zipped, and pulling down from the pants, they'll slide over my hips to the ground. I can't do that with any of my other shorts - except some old 36's I own. These may be between a 34 and 36, but they are NOT very close to a 34. I would go so far as to guess these are between a 35 and 36 (at least as compared to typical US sizes). I'm not sure if I'll try to replace these with the next size down or not. I can wear these with a belt (which is pictured but not included - and stated as such in the description). But again, I was going for comfort so didn't want to have to wear a belt. So be cautious as to which size you order. 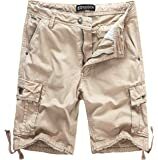 5.0 out of 5 starsHonestly The Best Cargo Shorts I've Ever Purchased...ANYWHERE!!! 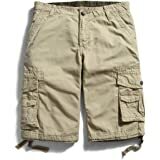 These cargo shorts are the BEST pair that I've EVER owned. 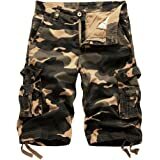 I have been searching for quality cargo shorts at a reasonable price point..these fit the bill! 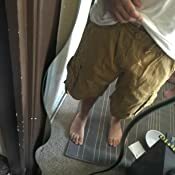 The quality is far better than any cargo shorts I've ever owned...even over-priced Abercrombie &b Fitch shorts. I have a 30" waist, and the "M/30 (US 29)" fit me perfectly!!! I've bought five pairs so far. And speaking of quality, the corners of the bottom cargo pockets are reinforced on the inside so the corners will hold up over time. BUY THESE!!! You won't be disappointed. 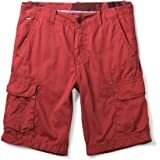 5.0 out of 5 starsNice, durable shorts that fit well. I wear a US size 34. I ordered the US size 34, which was the Chinese or label size 36, and they fit me perfectly. The material is thick and seems durable. They hang loose on my legs and fit great. I'm pleasantly surprised. I like these shorts a lot. 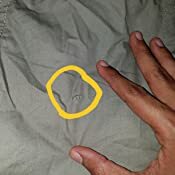 Edit: After 1 wearing one of the back pockets lost a button, and the button in front is loose. The buttons definitely need to be sewn on better. Otherwise, no complains. They didn't come with the brown belt pictured though. Not that it matters much. I have a belt. If you're looking to only wear these shorts 2 or 3 times, then they are perfect for you. 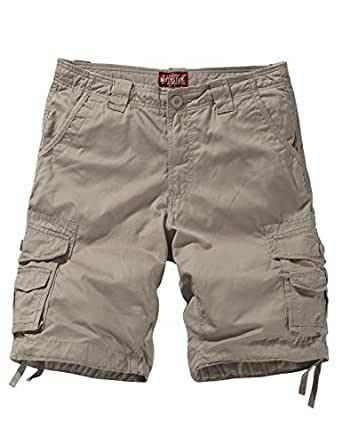 If you believe that the notion of cargo shorts is that they are a more rugged article of clothing that can weather a higher threshold of use then this product is not for you. Button broke the second time I wore them. No big deal, with the drawstring and a belt they were still serviceable. The third time I wore them the drawstring broke. After running them though the wash using the recommended care settings the lining began to unravel. Very low quality product. Looked very nice and stylish, but can't hold up the riggers of getting in and out of my car, and lying on a beach chair in the sun. 5.0 out of 5 starsVery please with quality, fit, and price. Pants fit me best when the waist is 35 inches. I bought the 2xl 36 inch waist size. These fit very well. I've worn them twice so far since they've arrived. The fit feels good, doesn't limit or interfere with movement at all [I went hiking and canoeing yesterday]. I typically don't carry much with me but there is plenty of pocket room for those that do. Quality seems to be top notch, time will tell but from what I can tell so far these look like they are made well enough to last a very long time under heavy use. No frayed ends, no loose or excess stitching/thread anywhere. Belt loops are sturdy and able to allow a thick leather belt to easily pass through. These shorts are ready to handle the river, the trail, the mountains, whatever - and look nice enough to step out into civilization with too. I'm very pleased with this purchase which was 10 to 20 dollars less than comparable shorts out there. Ordered a pair that I had ordered previously (actually 3 pair), all fit fine, but one pair had an issue with the zipper so reordered the same color and same size. The new pair fits a little more snug than the other 3 pair. They seem to be cut differently. Very disappointed. in general, i like the shorts. 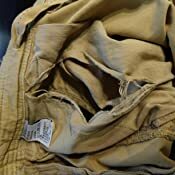 but having only worn them twice over a month, the pockets, both, had holes in them. that should not happen! also, 2 of the buttons have fallen off. After inspecting the other buttons, it appears that they have had one pass in the sewing machine thru the holes in the buttons. what I mean is that they have a single pass with the thread that is holding the buttons to the shorts. As such, they are very easy to break off. since it is 32 days since i ordered them, i cant return them. so now the 2 large front pockets are not usable and 2 buttons are missing. 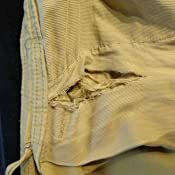 the idea of cargo pants is lots of pockets, but if you cant use the pockets cause they have large holes from poor materials and missing buttons from poor quality manufacturing, whats the point of owning them? I would not buy them again and you should not either.